JEFFERSON CITY, Mo. 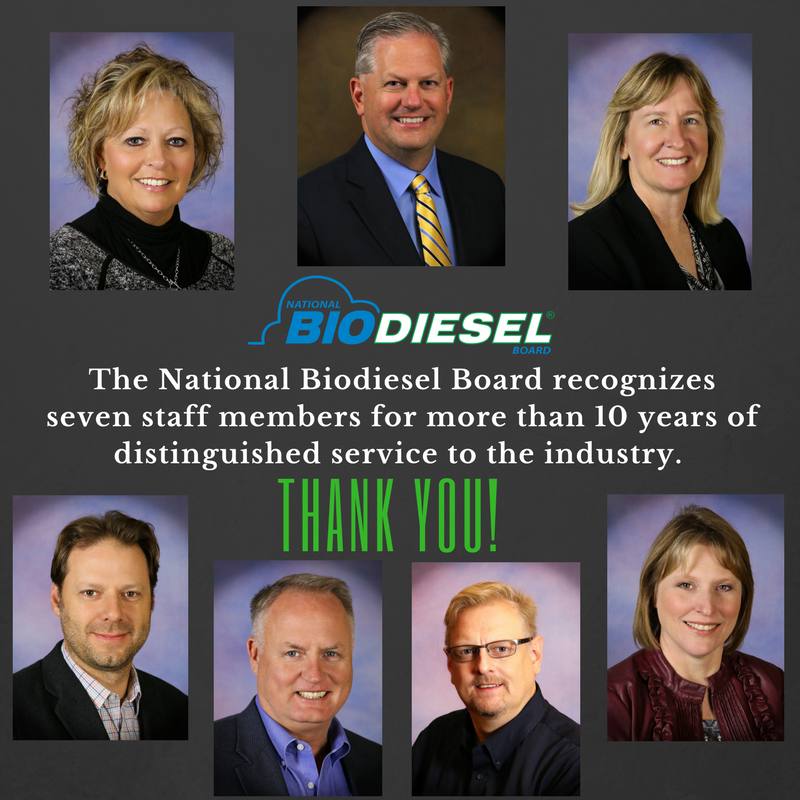 – The National Biodiesel Board has a staff team made up of experts in a wide range of fields with more than 180 years collectively at the organization, with even more experience directly involved in the biodiesel industry and from key contractors. During the recent NBB Membership Meeting in Washington DC, the organization recognized a number of milestone staff anniversaries. Along with a host of nationally recognized experts in their respective fields, the organization boasts a staff team that is uncharacteristically stable for a national association. Scott Tremain – Tremain is the IT Director where he is responsible for the strategic direction and implementation of NBB's information, technology, and computing systems and is a Principal in NBBIT, the independent web design, development, and web hosting company that maintains IT clients across the country. NBBIT provides organizations with comprehensive and professional internet and technology solutions including Web design, development, and marketing, online applications, web and email hosting, domain registration, graphic design, social media management, and related consultancy services. Tremain joined NBB in 2002. Tom Verry – Verry serves as Director of Outreach and Development where he works to establish relationships for the benefit of the biodiesel industry with key stakeholders including feedstock suppliers, state soybean associations, fuel suppliers, end-users, policy makers, government agencies, and environmental/health groups. Verry also works to identify and access resources that will address the needs of the organization and the industry and leads the effort to successfully secure revenue from outside funding sources allowing NBB member dues dollars to be leveraged four-to-one to support critical industry efforts. He also serves as the Executive Director of the National Biodiesel Foundation. Verry joined NBB in 2003. Donnell Rehagen – Rehagen serves as the Chief Executive Officer. Previously serving as Chief Operating Officer, Donnell managed the implementation and execution of NBB’s more than $14 million annual budget. Working with project managers, staff, and contractors, Rehagen has helped ensure NBB delivers outstanding results for members and funding partners. In addition, he has led the annual National Biodiesel Conference & Expo. Rehagen joined NBB in 2004. Desiree Hale – Hale is an Accounting Specialist responsible for processing Accounts Payable, Payroll and other reimbursement projects. In addition to traditional accounting responsibilities, she also serves as the Staff Liaison for the BQ-9000 Program, a quality systems program that includes storage, sampling, testing, blending, shipping, distribution, and fuel management practices. Hale joined the NBB staff in 2005 with a diverse background in long term care business management and municipal government financial services. April Yaeger – Yaeger is the Chief Financial Officer. She is responsible for managing all aspects of financial operations. She is a graduate of Southwest Missouri State University with a Bachelor of Science in Accounting and she is a Certified Public Accountant. Prior to joining NBB in 2006, she was the CFO for a not-for-profit service organization for 10 years. Anne Klempke – Klempke is an Accounting Specialist responsible for processing Accounts Payable, Accounts Receivable, and other reimbursement projects. She has a bachelor’s degree in business administration, with a major in accounting. Prior to joining NBB in 2006, she served 20 years in the US Army. Don Scott – Scott serves as Director of Sustainability for NBB. His program areas build science and awareness to ensure that biodiesel production meets today’s needs for environmental stewardship, economic prosperity, and quality of life without compromising future generations’ ability to meet these needs for themselves. Scott is a licensed Professional Engineer with a civil engineering degree from the University of Missouri. Prior to NBB, he was an environmental engineer for the Missouri Department of Natural Resources. His work there focused on protecting clean, plentiful drinking water. Scott joined NBB in 2007. Two other NBB employees, Office Coordinator Lola Helming and Information Coordinator Bev Thessen have been with the organization for 24 and 23 years respectively.